Level 3-5 is the fifth level of Fire Mountain in Mario vs. Donkey Kong. The high score for this level is 29000. 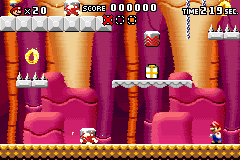 The level opens with a cinematic showing Mario doing a Backflip onto a platform to avoid rising lava. 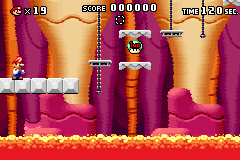 The first area has rising lava the player needs to avoid as they climb up the stage. Past the first moving lift is a couple of platforms with a 1-Up Mushroom, followed by two more moving lifts. After the third lift is the Key, which the player needs to carry back across the two lifts and continue upward. Riding across a sideways moving lift, the player then has to use a Springboard to reach platforms that lead to the locked door. In the second area, there are two Firebirds that fly around the bottom half of the area. The player first needs to ride a Kurasshā up to reach a platform, and then ride another Kurasshā to reach a pair of ropes the player needs to climb. The player can then ride the next Kurasshā upward to reach the Mini Mario. Red: In the first area, between the ropes above the Key. Yellow: In the second area, on the platform directly above where the player starts. Blue: In the second area. Instead of taking the Kurasshā to the Mini Mario, the player should continue left past another Kurasshā and use a Springboard (or ride the Kurasshā that leads to the Mini Mario, but instead of jumping right, the player needs to jump left) to reach a pair of ropes the Present is located between. This page was last edited on April 14, 2019, at 15:46.